Favorite Tracks - "Ames Room", "Recurring Dream", "Searching, White"
Silje's bio says "the songs were actually written as they were recorded. Silje notes the importance of this presence that comes from recording spontaneously, with all its imperfections." This isn't a pefect, finished sounding record, it sounds like audible notebook sketches tossed into a gentle breeze by a tiny little girl. 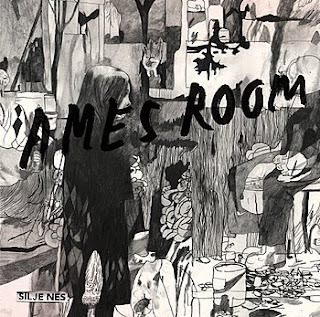 Nes offers delicate, whimsical, and experimental electronic pop and in theory I should sleeping with this record on my pillow just to keep in near to me at all times but alas it is the unfinished feeling of Ames Room that leaves me feeling unsatisfied. I like vocals on a record to leave a deeper footprint any carry some sort of dynamic character but with Silje Ames every song tip toes into the next. Her barely audible melodies evaporate as soon as it exits my speakers...and half way through Ames Room, make me very sleepy. If you are looking for the cotton candy of muffled pop (minus "Searching, White") then perhaps this is a record for you. The reviews of Silje I have read are all very positive so don't let my personal need for a less winded vocalist deter you from checking this record out. Silje just played here in Charlottesville, opening for the Dodos at the Tea Bazaar. Great show. She played with a very low-key drummer. I wanted to chat with her when it was all over, but it appears she left during the Dodos set. But how do you like the record? i'd have to make it all the way through it first to make any sort of comment. i was debating not going to the show (i was very tired), so i listened to a couple of songs before deciding to go. 'twas totally worth it. i haven't listened to much music outside of what i needed for my wtju marathon shows (LOTS of velvet underground and fiery furnaces bootlegs) for the past couple of weeks. Did you see Lou Reed is coming to RVA? I think he is playing the National! Yeah, I'm trying to see Lou but I'm really strapped right now. If they'd announce the opener (it's Melt-Banana in DC), it'd help.